Once only a small fishing village, Ayia Napa has become one of the world's best travel destinations, known as a cosmopolitan resort area. Located on the eastern coast of Cyprus, it is a town of great beauty, full of history and culture, with friendly and hospitable people. Nearby Protaras is a popular resort area with some of the world's best golden beaches, crystal clear waters and lively entertainment. Whether you are looking for fascinating history, vibrant culture and nightlife, astounding natural beauty or a relaxing beach vacation, together these areas make up one of the Mediterranean's most desirable destinations. There is a wealth of attractions and places to visit, both beautiful and interesting. Be sure to visit the Monastery and the Old and New Church dedicated to Virgin Mary, the picturesque harbor, the Municipal Museum ‘’Thalassa’’, the Makronissos Archaeological Tombs, the Venetian Aqueduct, and the rural churches and chapels all around town, as well as the Sculpture Park, the Love Bridge, and the iconic ‘’I Love Ayia Napa’’ sculpture in the Central Square. Explore the multitude of intriguing nature trails lined with pine trees and a diverse botanical splendour whilst pausing to take in the spectacular views from the sea cliffs looking down to the beautiful Mediterranean Sea. Many benches are spread out along these trails to take a break from the walk and admire the surroundings in stillness. One of these nature trails forms part of the European Long Distance Trail E4, running from Cyprus to Gibraltar. Then there’s the Aphrodite nature trail which stretches 2 km along the North-East coast of Cape Greko which doubles up as a Cultural Route due to the mythical birth place of Aphrodite. A lovely monument to visit is the tiny white washed church of Agoi Anargyroi, with steps that lead down to the sea where there is a place where Holy water runs. Another trail leads to the ‘Cyclops’ cave where there is a picnic site close by. Specially made cycling paths are strewn throughout. Cyprus has the ideal climate for cycling all year round with low annual rainfall and light winds. Thirty foot high limestone cliffs have caves which have been hewn by Mother Nature. Taking a boat trip along the coast you will see that they are really striking, which is why they have been aptly named the ‘Palaces’. 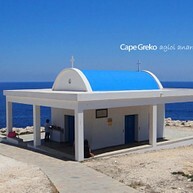 Cape Greko has warm sea temperatures ranging from 16 to 28 degrees and visibility reaching up to 40 metres. For this reason, as well as for the wonderful scenery and the marine life, this area is very popular with divers. This museum has the sea as its subject-matter. The exhibits cover a chronological span, from pale ontological and prehistoric periods until present times, and include among other things an exact life size replica of the ancient ship of Kyrenia of the Classical period (400 BC), the replica of a Mesolithic (9200 BC) papyrus vessel, a traditional Cypriot boat from 19th century, known as “Passara”, Cypriot antiquities, bones and skulls of endemic pygmy hippopotamus and elephants of Cyprus (8000 years old), and fossilized exhibits such as sea-urchins and corals. Moreover, visitors can admire stuffed fish, mammals, sea turtles and marine organisms, such as shells, barnacles, corals, sea-urchins, starfish, crabs, lobsters, sponges, marine plants and more found in various parts of the island. 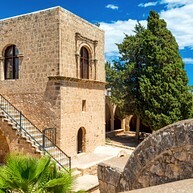 A landmark in the heart of Ayia Napa, the Monastery is the most important sight in town. It is easily accessible by all visitors, as it is located in the central square, about two kilometers away from the Harbour. Among some of the well known visitors of the monastery was the Greek Nobel laureate Giorgos Seferis, who was astounded by the beauty he faced when he visited the place. He decided to dedicate a hymn to the Monastery, and thus wrote the poem "Ayia Napa B" which can be found in his collection of poems “Emerologio Katastromatos C” (Logbook III). There is an uncertainty as to when the Monastery was initially built. The cave, the hiding place and the well, witness the presence of a Christian community there since the Byzantine years (11th century). The first element of the temple (13th-14th century) was built during the Frankish period, while the rest of the Monastery was completed during the 15th century. However, the Monastery as it stands nowadays is a construction of the 15th century, a time during which Cyprus was under the Venetian regime. The picturesque Ayia Napa Harbour is undoubtedly one of the main features of the town, after the Medieval Monastery and Cape Greco. Many decades ago, the harbour was just a small bay with a few fishing boats. In the beginning of the 70s, the first breakwater was constructed which basically marked the beginning of the current development of the harbour . 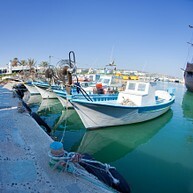 Nowadays, the Harbour is fully renovated with a large fleet of fishing boats, speed boats, sailboats and cruise ships. The land area is appropriately formed with pedestrian lanes which lead to the two lighthouses. Colourful and typically picturesque, the area around the harbour includes an open theatre, fountains, quaint cafes, fish taverns and restaurants. The ambiance around the harbour is a real ornament and it is rightfully classified among the most contemporary and picturesque harbours in Cyprus. The Agia Napa Aqueduct is one of the most important monuments preserved within the boundaries of the Agia Napa municipality. The Aqueduct supplied the monastery and the whole region with water for hundreds of years. The monument in its present state of preservation is an alteration of the original Roman aqueduct, occurred during the Frankish period when the monastery was built. The source of the water is to be found somewhere on the Northeastern hills of Ayia Napa. Up to the year 1974 the original visible route of the channel was marked by a barrel-shaped structure at the locality of ‘Mana tou Nerou’, known traditionally as the House of the Greeks. From that point the aqueduct ran all the way to the monastery following the natural contours of the bedrock. The Makronisos cemetery includes 19 Hellinistic and Roman tombs (2400 BC). The entrances were originally closed with one large or two smaller calcarenite slabs. Among the findings at the sight are clay sarcophagi which were originally covered with three flat tiles and a limestone Korre statuette (both displayed in the Thalassa Municipal Museum). The Sea Caves or “Palatia”, as they are called, are certainly one of the main features of Ayia Napa and the centre of attraction for thousands of locals and tourists. The Sea Caves, which are found between Kermia Beach and the Cavo Greco Cape, have a tremendous geological history and are of social, environmental and economic importance to Ayia Napa. A visit to the sea caves is a must for an enjoyable walk and a close view of the captivating scenery, designed by nature and time, and a dive into the crystal waters of the sea is a treat. 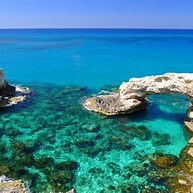 The geology of the sea caves is one of the determinant factors of Cavo Greco, which has been declared a protected area. The award-winning Ayia Napa Waterpark is one of the twelve best water parks worldwide, according to reliable sources of the American Television Network CNN. 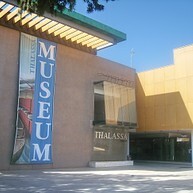 It is located on Ayia Theklis Street, on the west entrance of Ayia Napa. The Waterpark is an ancient Greek mythology themed park. What makes it special is the fact that the Greek characters of the water park are depicted in a simplistic yet realistic way throughout the water slides and the recreation areas of the park, including the plethora of games found in all entertainment venues, such as the Fish Spa and the Go Karts. The water park offers all-day entertainment and it is ideal if you want to spend a pleasant and carefree day in a world of mythology. 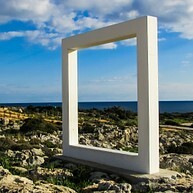 The Sculpture Park is found on the crossroad of Cavo Greco Avenue and Kryou Nerou, in an 20.000 sq.m. area with unbelievable natural beauty and panoramic views. It’s a park-gem, the first of its kind which acts as an oasis of culture, not only for Ayia Napa, but also for the whole area of Famagusta district. The park is adorned by sculptures which are created by many world-renowned artists who participate in the Sculpture Symposium which is organized every year by the Ayia Napa Municipality. 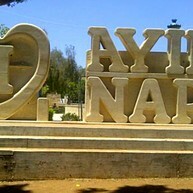 Visit the stone sculpture “I Love Ayia Napa” at the central square of the town and leave your photo in between the sculpture, to express your love for Ayia Napa in this way. The sculpture is placed at the Monastery Central Square and was created by the sculptor Yianni Yianni. The chapel is found on the Eastern side of the town and is devoted to Ayios Kosmas and Ayios Damianos, or the Omosianoi Saints as they called them, both doctors who treated and cured patients without receiving any payment. According to tradition, during their journeys in the area, they faced rough seas and their boat was carried away into a cave which has since been turned into a chapel. At a later stage, the new chapel was built on the rock right above the cave. The Saints’ blessed water “Ayiasma” is found in the cave under the rock. Church services are held on the 1st of July and the 1st of November. 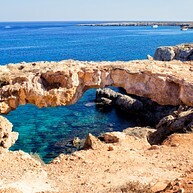 On the way to Ayioi Anargyroi chapel, on the right side, you’ll find “Kamara Tou Koraka”, an impressive geological formation which looks like a bridge or an arch. The bridge is located just outside the hotel 'Ayia Napa'. The crystal clear waters of the Cape Greco sea shore are amazing. They seem to be like blue mirrors reflecting the sun's light and they provide the perfect backdrop for photographs.